Adobe Photoshop is a comprehensive and popular photo editor. This book talks about the reasons why: when you work in Photoshop, you're not drawing from scratch - you're editing photos. The program keeps you interested with a depth of capabilities that few pieces of software can match. Adobe Photoshop is arguably the most comprehensive and popular photo editor around. Here are a couple of reasons why: When you work in Photoshop, you're not drawing from scratch; you're editing photos. Secondly, the program keeps you interested with a depth of capabilities that few pieces of software can match. Unlike other computer programs that have caught on like wildfire over the years, Photoshop is both powerful and absorbing. Just because Photoshop is a pleasure to use doesn't mean that it's easy to master. 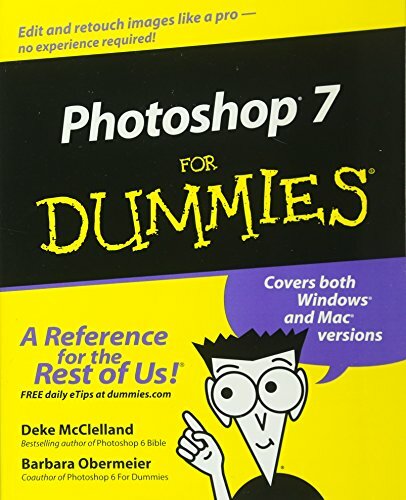 Directed toward making you comfortable and productive with the program, Photoshop 7 For Dummies points out the features you need to know and shows you exactly how to use them - no pain; all gain. You'll discover ways to. Work with the program window. Switch between Photoshop and other programs. Change the number of pixels in an image. Define colors using the Color Palette. Get ride of red eye. Blur the edges of a selected area. Apply filter effects Photoshop guru and author Deke McClelland reveals his own techniques for quick and creative image editing, along with specific tips that Photoshop veterans can use to take advantage of the software's new features. Plan to get the hang of. Producing high quality scans. Adding background textures, bevels, and text effects. Harnessing Photoshop's layering features and professional pre-press capabilities. Applying different types of gradients. Making a Web Photo Gallery. Placing your image into PageMaker of InDesign. Creating your own custom brush Graphics abound in Photoshop 7 For Dummies, with 16 pages of glossy pictures to show off special issues related to color. You'll find commands for both PCs and Macs and lots of step-by-step instructions to guide your image-editing efforts for print or the Web - in no time!